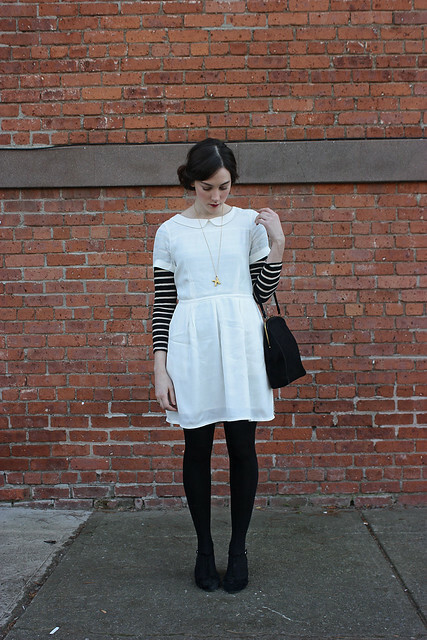 all this happiness: White Dresses, Black Tights. I suppose I've got a weird, gothy, ghosty vibe going on for this post and the last. Although today at work I kept catching myself in the mirror and feeling like some weird Burton-y character in an orphan's uniform. Or maybe I'm just trying to dress like my cat. It works for her. I love color, I do. I love staring at certain sweaters, sometimes sticking colors next to each other that don't particularly go but something about the brightness next to each other is pleasing. That said, there's something comforting to me about black and white (or black and cream). Black tights are especially nice, no matter what I feel good in them, as though attached to some kind of anchor. I bought this dress in late summer, and rationalized the purchase by saying I would wear it all the time come colder weather with black tights and chunky sweaters. I then wore it once and promptly forgot about it. I think that's a sign I need to do the winter-summer wardrobe switch-out, and maybe pull some of the old forgottens forward again. All of the sudden it's winter. I should probably start calling this a personal style slash weather blog, for all I talk about the latter. I used to try very hard not to, because complaining or talking about the weather is one of the most boring things ever. It's my least favorite small-talk topic, but there I am every post thinking about it. It's only that it so dictates what I end up wearing, to a certain degree. And it's a strange thing, especially given recent years on the East coast where suddenly everything is going a little bit nuts. I think this is one of my all time favorites, you look AWESOME. Never thought long sleeves would work with summer dresses; not that I can pull this off but I want to print this and cry because such a great idea. i really like the white dress with black tights look, too. have tried it a few times myself this season. it's a really good way to use a summer-ish dress for longer. don't worry about the weather small-talk. i used to be obsessed when i lived just up the street from a weather/clock. like i had to know the exact degree that it was...funny. great lippy, too. I really love this look!! It is so little Victorian Girl. Lovely! Love that dress, I've always wanted a delicate white dress like that. The stripes are so unexpected yet seem to fit perfectly. Love the stripes with that dress! I often rationalize weather inappropriate purchases by telling myself that I'll wear them in a way that won't make me miserable. I almost bought a 70s embroidered shift dress the other day because it had colorful parrots on it, and I told myself I would wear it when I went to Harry Potter World in Florida this past week. Then I realized that I have a buying problem, and I stopped myself! Kinda wish I wouldn't have, though. Anyway, I love your mix of summer and winter attire! I love this dress & the combo. And I always tend to talk about the weather endlessly on my blog, it's really hard not to! this is perfect. i am totally into the creepy vibes. 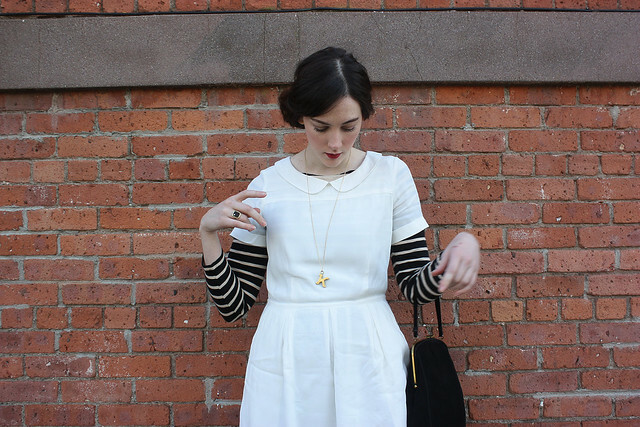 It must be the black and white stripes that are making you think of Tim Burton style! It looks really cute on you! just a suggestion but ditch the striped shirt and go for a black cardigan or a white shirt underneath. Stripes are too distracting. I love your white dress with the stripy top! I love the contrast in this look. Layering up summer dresses is my favourite! So pretty, your legs look amazing. Madewell is so perfect! I lvoe this look, you pull it off perfectly. i love how you layered that striped, black shirt under the white dress. i have a dress similar, now you've inspired me to layer it! This is great. A goth, Tim Burton-esque vibe is a good thing and you did it well! I love how edwardian white dresses feel with black tights. so pretty! This is so sweet and so cute. I love!